The tenement on the far right sat at the northwest corner of 6th Avenue and Lane Street in what is now commonly referred to as Chinatown. The view looks northeast although more north than east. The photo is used courtesy of the Museum of History and Industry, aka MOHAI. This now-then feature first appeared in the Pacific Magazine for Oct.16, 2005. Much of Chinatown in this southwest part of it was raised above the tideflats during the Jackson Street Regrade of 1907-09. This view was taken from a basement grade - used for a daylight parking lot - south and east of the intersection of 5th and Lane. It too looks to the north by northeast. Part of the south facade of Uwajimaya Village shows above. Between 1907 and 1909 while the destruction of Denny Hill was daily attracting its own unpaid force of sidewalk inspectors (otherwise idle), Seattle’s other big earth-moving project, the Jackson Street Regrade, was underway. 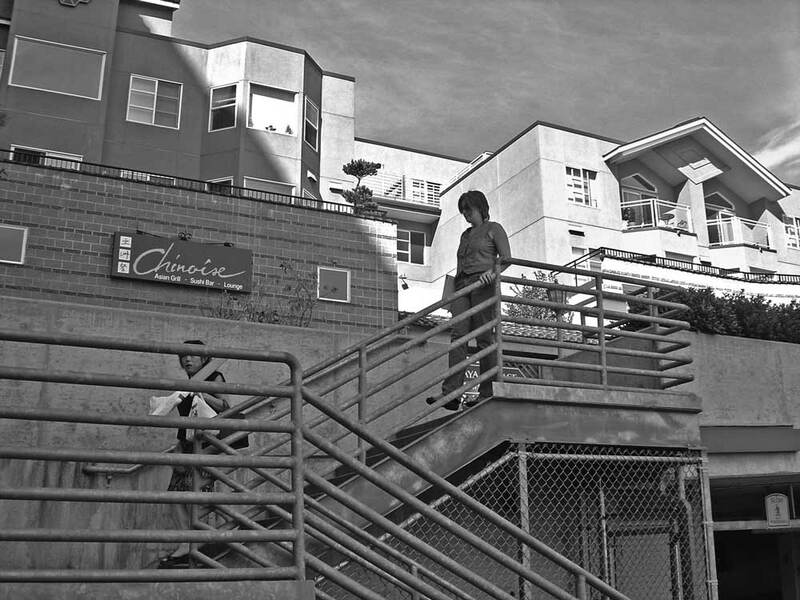 By comparison to the Denny Hill excitements this “second place regrade” was underwhelming to the curious public – until they started lifting the neighborhood. The Jackson Street Regrade was named for its “Main Street” and northern border. On Jackson dirt was mostly removed — lowered nearly 90 feet at 9th avenue. But here at 5th and Lane, three blocks south of Jackson, the blocks were lifted with dirt borrowed from the burrowing and sluicing along Jackson and King Street and also from the low ridge to the east. About fifty-six city blocks were reshaped by the Jackson Street regrade, twenty-nine of them excavated and twenty-seven – including these – raised. 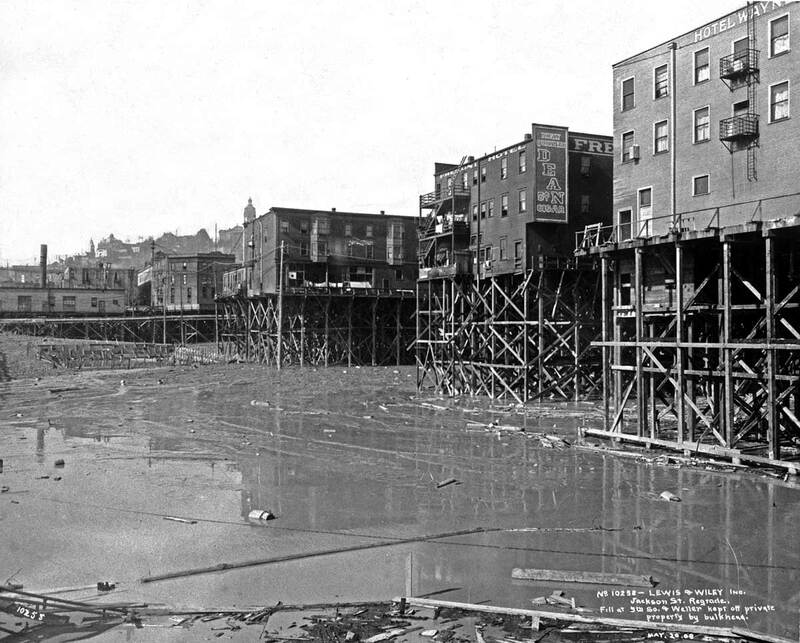 In particular, these blocks just east of 5th Avenue straddle both the old waterfront meander line and the trestle of the Seattle and Walla Walla railroad after it was redirected in 1879 to the shoreline south of King Street. 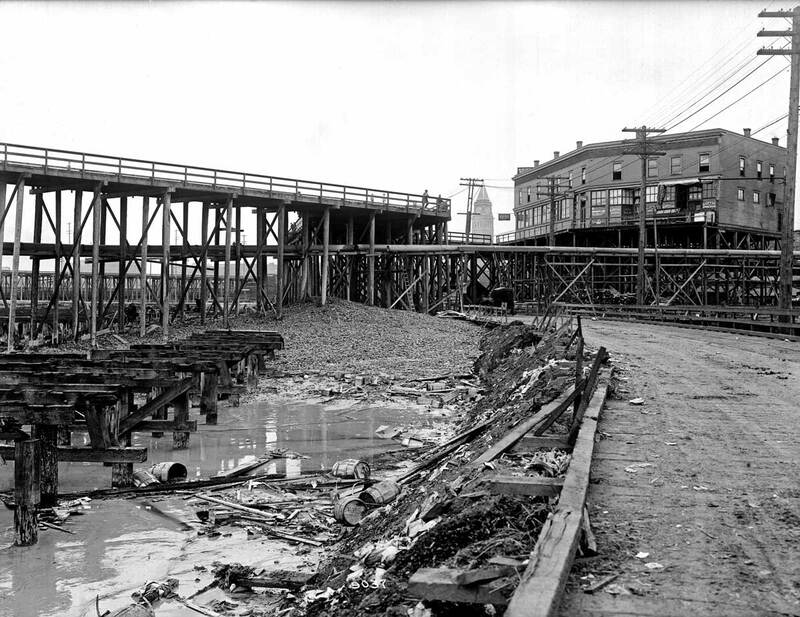 The wood-boring Teredo worms had quickly devoured the original trestle that headed directly across the tidelands from the Seattle Waterfront. In these raised blocks the city was responsible for lifting the streets to the new grade. The property owners, however, were required to both first lift their structures and then also to either fill in below them or construct what amounted to super-basements. Many chose the latter. Later this subterranean region would build its own urban legends of sunken chambers reached by labyrinthine tunnels and appointed for gambling, opium and other popular and paying pastimes. The contemporary use for this particular underground at the corner of 5th Avenue and Lane Street is as a parking lot for the International District’s by now historic Uwajimaya Village. Another 1908 look into the neighborhood being raised during the Jackson Street Regrade. The top of the then but three year old Great Northern tower pokes between the elevated building on the right and the trestle on the left. Courtesy, Museum of History and Industry aka MOHAI. This is P.L.C.D. responding. The grade on Jackson was changed a few times. I think some of these can be followed – with some effort – in my Pictorial History of the Seattle Waterfront. However, not all of it – by a long shot – is up on this page yet. So you’d have to check a library to search through it. That “book” was a report to the City Council that was never published in a conventional way, although perhaps 100 copies were “manufactured” for distribution to council members and other directly interest in the future of the waterfront and its viaduct. Every library was also suppose to have received one. But there is much in that thick tome, and some of it has to do with the changes in the tideflats and the streets adjoining. It is NOT indexed but is easy to search with the help of the table of contents, and just a finger search – looking at the hundreds of photos and figuring out the text context from them. We will most likely get the rest of that report onto the blog, but I think we will do it an easier way than that chosen by me for the parts that are now up. In fact, pretty soon with Ron Edge’s help – he of the “Edge Clippings” – we will also put up on this blog (Jean tells me our blog – with Berengere – is more like a blog acting like a webpage and I’m not sure how to spell any of it.) all three volumes of Seattle Now and Then. We will also – with Ron’s help again – insert the big book Building Washington I did with Genevieve McCoy in the 1990s (which we are fond of noting won the Governor’s Book Award in 1999), and Vols. two and three of Rich Berner’s Seattle in the 20th Century. Vol 1 is already in the blog. Ron is also processing the 1912 Baise real estate map with pretty accurate footprints for all Seattle Structures and legal descriptions too for all properties on the blog-web as well. And I know there are other books we mean to scan and place but cannot think of them for this moment. But back to Jackson. Before the fire of 1889 Jackson began to be filled – slowly. Soon above this was built a trestle and pretty much, I think, to the present grade. In fact, I think, some of Jackson is still on a trestle. The trestle once upon a time continue east on Jackson through its intersection with 5th avenue at least one story above 5th Avenue. This the neighborhood regrade 5th was lifted to the level of Jackson where it still, and all of it secured on a proper bed of dirt scrapped from the ridge to the east as part of the taking and trading quality that we so elegantly use with the regrade. (The Mountains were humbled and the low places exalted.) The level where the trains are is a little ways above high tide for obvious reasons. It is a reclamation or fill – like the waterfront. (There’s much on that in the Illustrated Waterfront history.) For a while it was thought-and-worked that the streets that went south over these reclaimed tidelands would be “trascended” by testles for wagons, cars, trucks, hovermobiles. These plans-and-operations were, however, changed when it was determined that the motorcars would not get in the way of the trains down on the reclaimed tideflats, if they were careful about them. It was originally thought that there would be more heavy industry down there. Instead it is mostly light industry and lots of warehouses for whom truck service is important too. So down went the trestles south of Jackson and forever after where the main railroad lines head south we have had to wait in our cars and trucks and read comics or the New Yorker of swear about politics and religion and the cost of anything these – or those – days. Now I remember a story I wrote long ago about some early regrading on Jackson Street as it approached the tidelands east of 5th Avenue. I think that regrading was mid-1880s even before that required for the trolley that came down it in 1888-89, which was first a cable car like on Yesler Way but then changed to electric. I’ll now go fishing for that feature and see if it shares anything of value for you. Hold on D.T.N..
I’m back but with no luck. I’ll search later and when found put it and any other Jackson St. stories I find up with regular insertions on top of whatever page we are then on – later.